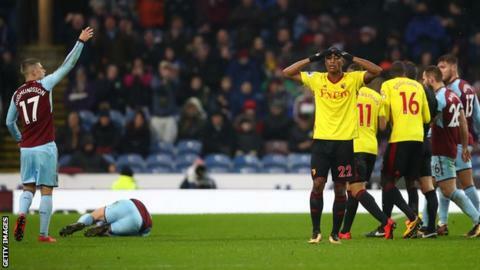 Watford defender Marvin Zeegelaar has had his appeal against the red card he received at Burnley on Saturday rejected. The 27-year-old was dismissed for a two-footed challenge on Steven Defour in the Hornets' 1-0 defeat at Turf Moor. The Dutchman will miss the club's festive fixtures against Crystal Palace, Huddersfield and Brighton. "It was a harsh decision," Watford boss Marco Silva said on Saturday. Speaking after the game, Silva added: "It's not a red, it changed everything, and after two or three minutes they scored." Watford will look to win their first game in four when they take on Roy Hodgson's Crystal Palace on Tuesday. Will Kane break Shearer's goal record?